splitcoaststampers.com | Stampers With Altitude!!! 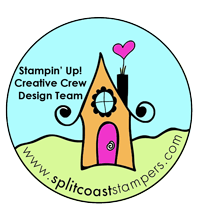 This month, we (The Creative Crew on Splitcoaststampers) were asked to create a “Blank slate” meaning a no layer card. This is usually a challenge I have a hard time with but I thought, “if I could sponge a great background, it will be ok.” I used a LOT of different colors. Soft Sky, Powder Pink, Sweet Sugarplum, Rich Razzleberry, Crushed Curry (for the sun), Pacific Point and Tempting Turquoise. I wanted a sunset scheme to go with the all (Archival) Basic Black Bridge, Birds, and Sentiment. I think this card came out pretty nicely. What do you think? The stamp set is called Wherever You Go. It fits in very well with the travel/staycation theme we were given. I really love the sun stamp and I was determined to use more of the set for this card.